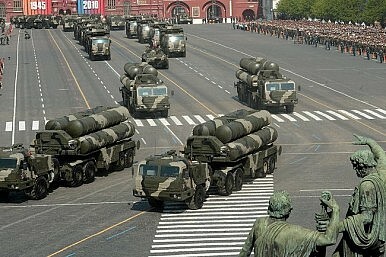 China will become the first foreign buyer of Russia’s S-400 missile defense system. Russia may have just lifted its ban on supplying Iran with S-300s, but it has also reached a deal to supply China with the S-400 Triumf missile defense system. The S-400, an upgraded version of the S-300, had previously only been available to the Russian Ministry of Defense. China will be the first foreign buyer. The S-400, which is manufactured by Almaz-Antey, has been in service in Russia since 2007. The sophisticated air defense system is capable of firing three types of missiles, creating a layered defence, and can simultaneously engage 36 targets. The system is able to shoot down aircraft–manned and unmanned–and missiles–ballistic and cruise–within a range of 400 km (248.5 miles). Despite the ongoing talks, some had felt that Russia would ultimately refuse to sell China the S-400 surface-to-air missile system for a number of reasons. First, there were reports that Russia planned to withhold all foreign sales of the S-400 until Moscow’s own military needs had been satisfied, sometime later this decade. More importantly, there were widespread concerns in Russian military circles that China would purchase a few of the systems with the intent of stealing the technology and reverse engineering a domestic version. While it may be easy to view this sale as a new stage in the burgeoning relations between Russia and China, it’s nothing really new. As of 2008, China fielded approximately 40 S-300PMU systems, as well as 60 HQ-15/18s, a Chinese-built version. That China is the first foreign buyer for S-400 was something of an inevitability. Still, the re-kindling of Russia and China’s friendship worries some, especially in light of Russia’s schism with Europe and the United States over Ukraine. Their reinvigorated ties span not just military technology but include vast energy deals. The second gas deal, the parameters of which China says will be settled later this year, aims to supply the energy-hungry country with gas from western Siberian fields. The difference between this deal and the first is that the second would lead “to a pipeline that will, for the first time, allow Russia to choose between exporting gas to Asia or to Europe,” whereas the May 2014 deal involved gas that could only economically be sold in Asia. Chinese foreign minister Wang Yi, in a March press conference, said the energy deals with Russia were part of China’s One Belt, One Road strategy for increasing engagement and trade with its neighbors.